A large focus of Tibetan culture and community is centered around community prayers and gatherings. The Dekyi Ling Community hall was funded by Samten Tse Charitable Society (STCS) and built as a place for those living within the Tibetan refugee settlement, to have the facilities for gathering together to perform prayers or hold community meetings. This enables the strengthening of the community and provides a safe and sheltered environment that can be used for various purposes. 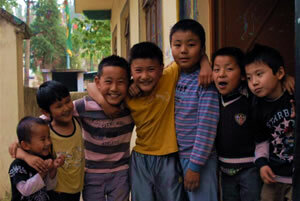 Your donation will be directed to Samten Tse Charitable Society. STCS is a private non-profit 501(c) (3) tax-exempt organization, established to support and fund the work and various charitable projects of Her Eminence Jetsün Khandro Rinpoche in India and abroad. Yes! Your payment information is secure!